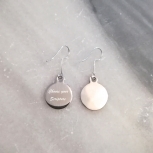 A pair of rope link earrings with your choice of two scripture charms made from stainless steel. 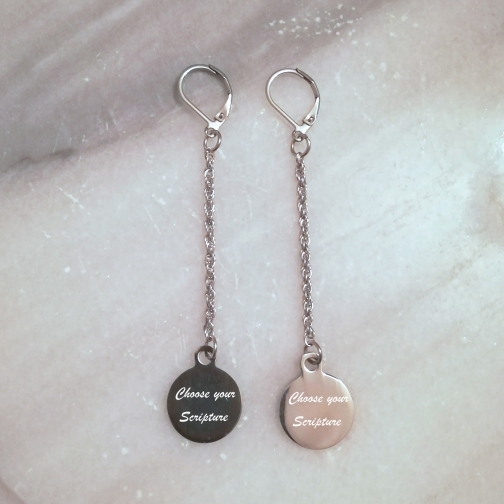 If you would like the same scripture on both charms select only one scripture charm choice. Please see scripture choices below. 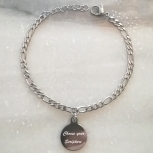 Click the 'Available for Custom Orders' link under 'Add to Cart' to write your choice/s of scripture. 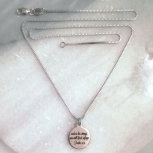 All Love and Dove jewellery is hypoallergenic, lead and cadmium free, and nickel safe - created from high quality stainless steel chosen for it's durability and non-tarnishing beauty. Every piece includes free gift wrap comprising of a velvet jewellery pouch with gift tag (gift tag is blank on one side for you to write the recipient name and says "handmade" on the reverse side). Inside the velvet pouch you'll find a mini gift card to write your own message inside. 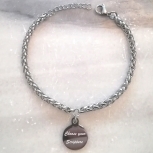 Sending Love and Dove jewellery directly to a recipient as a gift? We will write your personal message inside the mini gift card and recipient name on the gift tag free of charge! 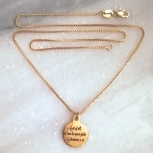 Just contact us with your gift message. Item ships from: Oakville, ON, Canada. $8.99 CAD ($2.99 CAD when combined with another item) by Canada Post. $0.00 CAD by Canada Post. $12.99 CAD ($3.99 CAD when combined with another item) by Canada Post. For global shipping we offer discounts when more than one item is ordered and shipped together! Orders take 3-4 business days to produce as pieces are custom made by hand, so please allow additional time before items will be shipped. Jewellery can be returned unworn and in its original packaging within 7 days of purchase for a refund of the item cost minus shipping costs. Please contact us to arrange the return. Buyers are responsible for return shipping costs. If the item is not returned in its original condition, the buyer is responsible for any loss in value.